Hokule'a Update - Safely Arrived in St. John, USVI! Check out the update at Hokulea.com! Practically just a hop skip and a jump to NYC, yeah? Somehow gives me chicken skin to think that they've made it all the way around the world from the 'aina and have now arrived in waters that I've been lucky enough to sail on myself. Crazy week at work and I didn't do much worth reporting on (ok, TQ and I did make it to a fun slideshow presentation about a boat trip on a section of the Peruvian Amazon that Old Salt Blogger Rick Spilman took with his lovely wife Karen and his lovely and adventurous mom, another excellent talk, thanks Rick!) but I did enjoy a very special online treat on Thursday, when the waves in Waimea Bay were not too big, not too small, but juuuust right for the Quiksilver In Memory of Eddie Aikau big-wave surfing invitational to GO! I couldn't watch much but I did indulge myself during a busy day with an occasional break to watch the live stream at worldsurfleague.com. So amazing being able to watch even a little bit live from my desk in Manhattan! And here's more of that wild jetski stampede that was briefly shown on the highlight reel! (sorry non-Facebookers, cannot find the video itself anywhere outside of FB), Now, I know we kayakers tend to dislike jetskis, but these guys? Wow. These are the lifeguards and safety staff for the event, and it's amazing what they do out there. And that is a MONSTER wave. Nothing but respect! Snippets of that same video plus iinterviews with the riders here. Special mahalo to Terry Marie at Hawaiian Ocean Adventures for posting the first thing I saw on FB about the Eddie being on! I think she'd posted it was looking good the night before and I saw that early on in the day here in NYC. I don't usually stay out after dark in the wintertime, but with warm air, no wind (there was the lightest of breezes when I set out at 3:30, and then it just died down to nothing while I was out - good thing I took a kayak instead of a Sunfish, would've ended up paddling home either way and a kayak paddles way better that a dinghy! ), and the only other boat out being the harbor police, I made an exception today. 9 miles, getting back in light rain. Click on any photo for a slideshow view, today the photos of Jamaica Bay doing its best mirror impression ARE my trip report. Nope, not me! I have been known to go out paddling in some pretty frigid conditions, but I am not counting myself among them this time. I did end up walking a mile and a half outside on Saturday, and probably just a little under a mile outside yesterday, but I didn't particularly embrace it, it was more a practical matter of getting places I needed to go. As I've mentioned in a couple of places, I actually rearranged brunch plans yesterday to cut down the walking/waiting in the single-digit outdoors, but there were other things that did necessitate a little time outside. This post is in honor of those who went out in the weekend's single-digit and even briefly negative temperatures voluntarily, with smiles even! One of the necessary destinations was the GrowNYC Sustainability Center at the Courtelyou Road Greenmarket. I keep my compostable food scraps in the freezer to keep down the smells and the vermin (my building is not bad as older buildings go, but there are occasional mouse and roach incursions, so not leaving food around where they can get it is important). The bag was full up and taking up a lot of freezer space; I would usually have taken it to Sebago but I forgot a couple of times and then the last time I went, last weekend, I didn't think I would be able to get to the compost bins because of the snow. I was headed to Play Fair at Javits Center yesterday, Cortelyou Road is right along the way, and when I checked the Brooklyn Greenmarkets FB page for weather updates, I was delighted to see that they were open for business and that compost collection was going on as usual. The booth volunteer was well-dressed for the cold, and cheerful - you can't really see it in this picture but she's giving me a smile and a thumbs-up sign! It may have been up to 2 degrees at this point, late morning, but it was probably still -1 when this stalwart lady arrived to set up her booth! Winter Warrior #1! Woohoo! And then there's Winter Warrior #2 - or perhaps I should say Winter Warriors. This isn't actually from the weekend, this was one year ago yesterday. Facebook has this "memories" thing, where it pulls up posts from the past (one-year increments, usually one year ago, sometimes more), and FB has been tormenting me with pictures from the sailing trip with friends in the Caribbean that TQ and I enjoyed so very, very much, but yesterday it finally came back to Brooklyn with this Coney Island Polar Bear photo that I took on a very windy day. Fun to see this one again. I wasn't there this time, but the Polar Bears didn't let this cold snap stop them, nope, these Winter Warriors came out to play! Click here for a Daily News video of the Bears at their icy Valentine's Day frolic. I'll wait for Easter, thanks! I'm planning to swim outside, or at least float around outside, today, but that's going to be in a heated rooftop pool at a spa in Queens where a friend is celebrating her birthday. That's as close as I'm gonna get to an outdoor swim this time of year without first travelling a considerable distance south! PS - next video after Coney Island Polar Bears is a most adorable polar bear cub. PPS - video after cute polar bear cub is stupid gossip, don't bother, was hoping for a whole string of polar bear fun but no such luck. 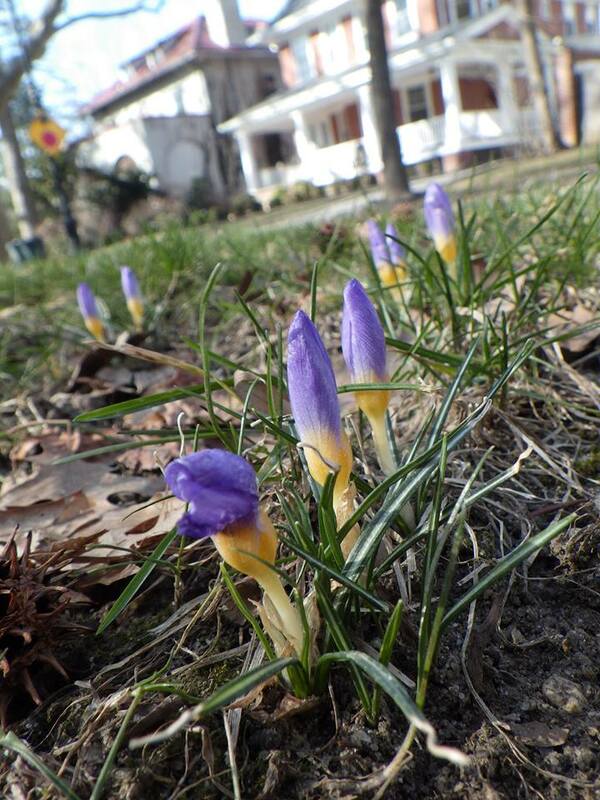 you silly crocuses. You should've stayed in bed another week. And me? Totally a couch and cookies day today. BRRRR. This Afternoon: A slight chance of snow showers. Mostly sunny, with a high near 23. Wind chill values between -5 and -10. Windy, with a northwest wind around 31 mph, with gusts as high as 47 mph. Chance of precipitation is 20%. Tonight: Partly cloudy, with a low around 1. Wind chill values between -10 and -20. Windy, with a northwest wind 22 to 28 mph, with gusts as high as 43 mph. Jones Beach Seal Hike, 2/7/2016 - Photos by Frank F.
Frank F., leader of last Sunday's excellent hike at Jones Beach, got some beautiful pictures of the day. Click here to visit his Flickr album. I'm so glad I decided to drop the all-day cleaning session I was originally planning on having on Sunday in favor of making the weekend into a good Sebago double header, especially with this Presidents' Day weekend's temperatures dipping down into the teens during the days and ONE DEGREE (one???!!!) on Saturday night. I just rearranged brunch plans on Sunday to lessen outside time. I guess we had to get a little actual winter in this winter, which was a pretty mild one up until this month. Really can't complain too much, but still - brrrr. I do have plans for Sunday and Monday, but I do think there's gonna be some couch and cookies time tomorrow! Quiksilver Eddie Aikau Big Wave Surfing Contest - ON TODAY! OOPS. dang. Except it's not. Update, 1 pm NY time, 8 am Hawaiian Standard Time - oops. Only not. As all good waterfolk know, there's the forecast, and then there's what you actually get, and sometimes they just don't match up as well as you would've liked 'em to and there you are with what you actually got. I'd actually looked at the WSL site, first thing I thought was "OH COOL IT ACTUALLY WORKS!" and then the second thing I thought when they panned out to the bay was "huh, those don't look that big". Big enough that I wouldn't go but not as big as I was expecting to see for the contest. Well, sorry for the false alarm, I'll leave this up for the Surfline link and I'll just re-post if they get to do it this year. Bummer bummer bummer. OK, quick quick post here - this big big big wave surfing contest that happens in Waimea Bay ONLY when waves reach a certain height is actually going on today for the first time in 6 years! You can watch it live on worldsurfleague.com - I have tons to do at work today but I won't be able to resist peeking in some! ps - as of 8 am Hawaiian standard time, they're still running a broadcast, no surfing, just talking story about surfing and Eddie and Waimea Bay, could be interesting if you have time to watch. There's a nice history of "The Eddie", in a sort of slide show/article combination, with glorious photos, on Surfline. Big day on the big waves in da 'aina tomorrow! Still so grateful that my dad and I got to watch one of these in January 2002, before my folks left Oahu - we didn't set out meaning to see it, we didn't even know it was happening, we just knew there were big waves going on on the North Shore and were headed over there to see those - got stuck in a MASSIVE traffic jam that started just after Haleiwa, saw everything set up on the beach as we passed Waimea Bay, and then just as we were getting into Waimea town, a car backed out of a parking space just as we got to it (perfect!) and my dad grabbed it. Awesome thing to see. With another fine-looking forecast for winter paddling today, TQ and I called for a paddle and once again got takers. YAY! I think we at the club have gotten a little out of the winter paddling habit what with the last 2 winters having been fierce enough to discourage us from paddling, but I'm delighted to have taken advantage of this present mild winter and had good paddles 2 weeks in a row. Today's was about 10 miles and we had a nice surprise on the way back when we saw another paddler heading our way who turned out to be John D., the head ranger at Floyd Bennett Field. He was just out to have some fun on this lovely day, same as us, always good to run into him! Good birds today - the usual bufflehead and brants (oddly quiet, we had a couple of flocks fly by without their usual hrnk-hrnk-hrnking), and then once we were out from under the bridge, there were longtailed ducks (formerly known as oldsquaws), mergansers, and a loon. Lovely day out on the water, with a rainbow around the sun near the end. I didn't go quite as photo-crazy as I did last week, so I can just post 'em here. Click on any photo for a slideshow view - this is it for the trip report. Monday note - The next day, hike leader Frank F. led us on another excellent hike around the point at Jones Beach. Unfortunately I failed to put the card in my camera, so no photos. Well, partially unfortunate, because it was beautiful out there, with the snow still on the beach, but also fortunate, because sometimes it's good to just enjoy being outside watching the seals swimming by (there were a bunch heading out towards the mouth of the inlet, where there's a tide rip that we guessed might be a favorite fishing ground for the phocine folk) and the winter waterfowl (ducks and geese and loons), instead of obsessing over trying to take their pictures with my not-quite-zoomy-enough zoom lens. Lovely day, lovely Sebago Canoe Club double-header weekend, gave my little black box all kinds of fun data to chew on, and then even got some cleaning and bill paying done last night. It seems there was some sporting event over which it was my duty as an American citizen to get lathered up, but I couldn't quite squeeze that in too. Maybe another time. With what I did do, I now feel pretty ready for what's likely to be a seriously chained-to-my-desk kind of week. Originally I was planning to stay home and do serious cleaning on Sunday, as I have a houseguest arriving on Thursday, but then I thought about the big deadlines I have this week and the long hours I'm likely to be working and decided to cut myself some slack and go have some outdoor fun on both days. My houseguest is family, he won't mind! Now, on to Saturday's photos. Enjoy! Plenty of evidence left in yesterday's snow that it's definitely not just us human folks who enjoy the grounds at Sebago Canoe Club! So here's a fun new thing - as of yesterday, I'm a participant in an NYU Langone study of the effect of exercise on blood glucose levels of chemo patients. One of the researchers had stopped by during my 4th infusion to see if I wanted to participate, and I said "Sure!". I'm part of the control group, who gets to just do what we usually do. Another group will be given an exercise regimen to follow. I probably couldn't have volunteered for the regimen group as the next few weeks are gonna be crazy at work, but my normal winter activity, when I can talk myself into it, is lots of walking interspersed with paddles. I say "when I can talk myself into it" 'cause although you wouldn't guess it from my "halfway through chemo" post, I'm actually such a warm-weather gal that in the wintertime, there's always a part of me that would really like to just curl up on the couch and eat cookies all winter. I try not to let that part win, though, 'cause I know I feel better when I'm keeping up at least a moderate activity level. One thing I was kind of psyched about with this study was that participants are asked to wear exercise monitors for a couple of weeks, and I thought it would be interesting to see how much I'm really doing - am I more lazy or less lazy in the winter than I think I am? - and also that seeing that might inspire me to do more. So yesterday, I went for a 6 minute walk test (gives them a baseline fitness level - I was expecting a treadmill but they have you walk up and down a hallway around 2 cones, felt kind of silly but I guess it lets them measure how you walk naturally) and then I got my monitor during my infusion. Well - it turns out that although they understand that the control group may be inspired to be more active by being part of the study, they don't want us to be actually looking at this doohickey and setting ourselves goals (exactly as I was thinking I would do, in fact), so they set it to a blank screen. Sort of like having a personal flight data recorder, where it tracks a bunch of stuff but you don't get to look at it. Bummer bummer bummer. Oh well, I still don't want it to go home and tell mean stories about how lazy I am, so I'm walkin' here, I'm walkin'! Haven't done a cancer update for a while, 'cause basically there hasn't been anything really noteworthy to mention, but I thought I would have someone take a picture of me today to show how I'm doing here at the halfway point in my chemo treatments. Pretty well! I actually had a whole week without a doctor's appointment last week (woohoo! ), I'm done with the weekly reconstruction appointments and now I just have 4 more chemo infusions, each one 3 weeks apart. I'm glad I took the kinder, gentler of the 2 chemo options I was offered; on the one hand, I would most likely be done with the chemo at this point (4 sessions 3 weeks apart instead of 8 sessions 3 weeks apart), but from what my oncologist and her nurse said, it would have been a much more disruptive process - like I probably would not have been up for the fantastic 7.5 mile paddle I went on with friends at Sebago today, and I certainly wouldn't have been out and frolicking about the way I was on New Year's Day. There will be a 2nd operation for the reconstruction in April, after the chemo's done, and I'll have to stay off the water for a month after that (boo) but I should be able to paddle again in time for the Hokule'a's arrival in early June (that has been my main goal through all of this!) and the initial recovery from this one will be much faster than the October recovery. I do get a slightly upset tummy for a few days after each infusion, with a couple of more intense, but isolated, gastric rebellions (mostly a matter of learning what I can and can't eat after an infusion, I really do have to go bland for a few days afterwards), and I think it may make me a little tired, but I haven't missed any work, and I've been getting out and having fun on weekends. As I think I've said before, some people have ordeals when they go through this, but at this point, I'd still rate my own experience as more of a hassle than an ordeal. So far so good! More pix from Sunday here. What a beautiful day on the bay! Full description of the trip over there.